The live blog is now closed, thank you to everyone for reading. Please find the full story here or visit our homepage for the latest news. 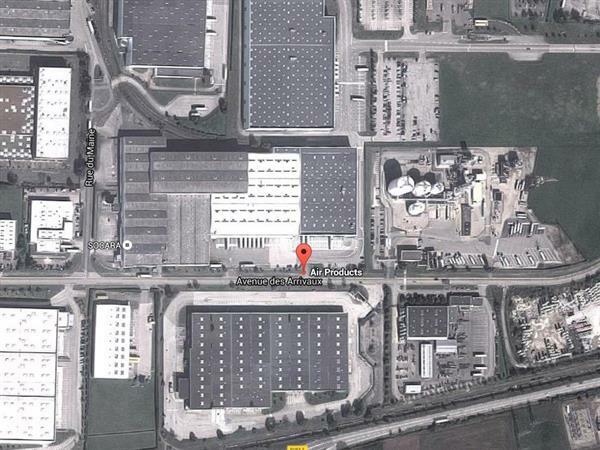 The IndependentA man has reportedly been decapitated at a factory in France. Good morning and welcome to our live blog on the unfolding situation in France after a suspected Isis supporter attacked a factory in Isere. At least one man has died, after reportedly being decapitated, and two more people are believed to have been injured. The suspect is in custody. 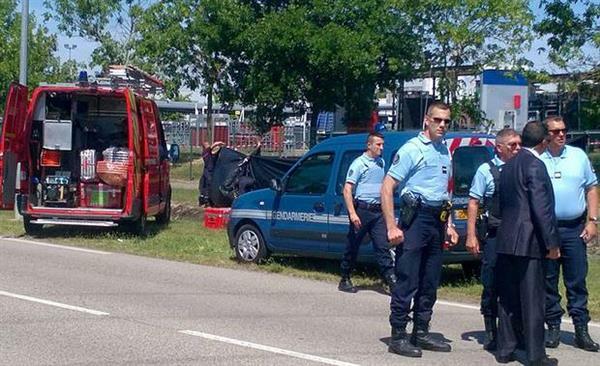 Isis-linked terrorists attack a gas products factory in rural France today, causing an explosion and decapitating a man whose head was later found attached to a wire mesh fence. 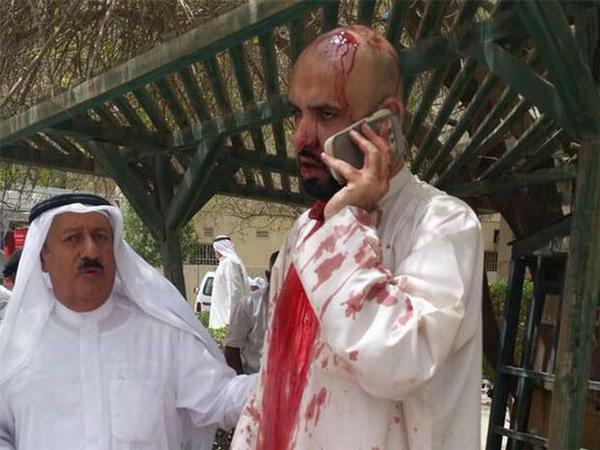 One of the attackers, a man in his 30’s with known radical islamist links, was arrested, police said. 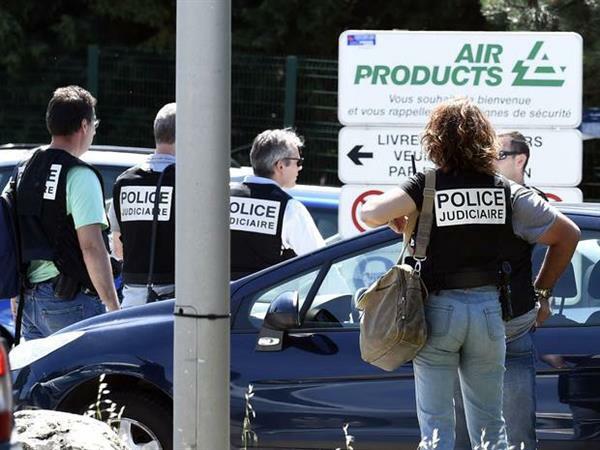 Two men in car forced their way into the compound of the Air Products factory at Saint-Quentin-Fallavier in Isere near Grenoble. After driving at speed within the factory grounds, they rammed a pile of gas cylinders, causing a small explosion. Police sources said that an injured man, a decapitated corpse and an Islamic State flag were found at the scene. First indications suggested that neither of the victims was an employee of the factory. According to Le Parisien newspaper, the man's face was covered in Arabic writing. 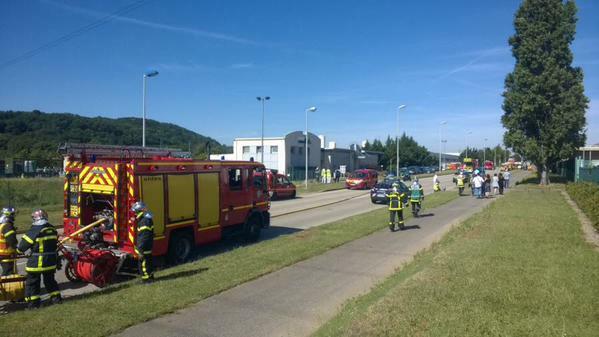 The IndependentA man has reportedly been decapitated by suspected Isis supporters at a factory in France. Video footage of the scene near the factory posted online by a French newspaper shows the area cordoned off by police, with journalists gathering as traffic is turned back on the road. French journalists say the arrested man is refusing to confirm his identity to police. There were reports of two attackers in a car but police have not announced a search for a second suspect. President Francois Hollande will be returning to France from Brussels following news of the attack. Here is how Air Products describes itself on its website: With our atmospheric gases, process and specialty gases, performance materials, equipment, and technologies, we supply innovative solutions to energy, environment, and emerging markets. An emergency meeting of France's defence council has been called this afternoon at the Elysee. David Cameron has spoken to Francois Hollande to convey his sympathies to the French Prime Minister, Reuters reports. 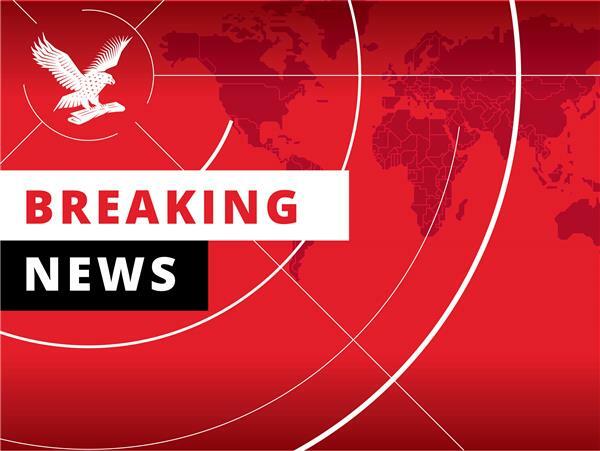 Marine Le Pen, president of France's far-right National Front party, has reportedly spoken of television to ask that "firm and strong measures" are taken "immediately" to "defeat Islamism". "The marches , slogans and emotional communication must finally give way to action." There is continued confusion over why initial reports said there were two attackers in the car, but only one man has been arrested. French journalists have speculated that the second suspect could be among injured people and may be detained after treatment. A Downing Street spokesperson said David Cameron has expressed his condolences to President Francois Hollande during EU talks in Brussels. "He expressed his sympathies for what looks like an appalling incident," she added. "Details are still emerging, so we wait to see those. But it clearly looks an extremely concerning situation and our thoughts are with all those affected by it." President Hollande is speaking at a press conference now. He says security has been increased and measures are being taken to prevent any more attacks. He sends his thoughts to the victim and says European leaders expressed their sympathies during talks this morning. He called for action, prevention and deterrents, saying that although there was "a lot of emotion" following the Paris attacks, France will "never give into fear". "There is emotion but emotion cannot be the only response. There must also be action, prevention, dissuasion. It is vital to further our values, to never to give in and never, whatever the circumstances, create unnecessary division or intolerable suspicion. We will ensure that the French people are protected and eradicate the groups or individuals reponsible for these acts." 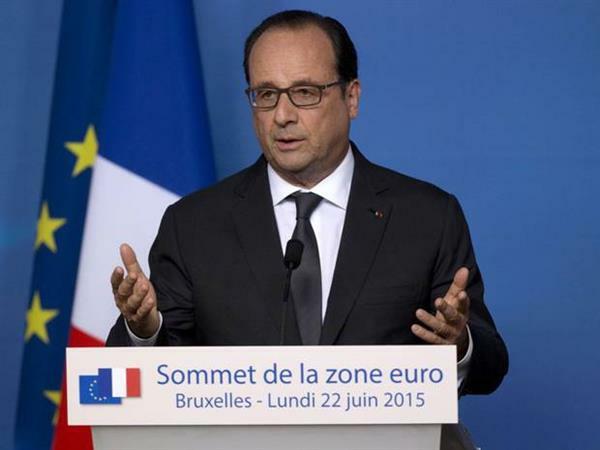 President Hollande said it bore all the "hallmarks of a terrorist attack". 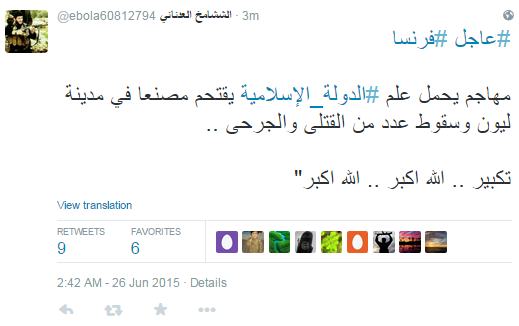 Isis are also suspected to be behind a bombing at a Shia mosque in Kuwait today. Although it is unclear whether the group had any direct involvement in today's attack in France, they have been extremely active in recent days with beheadings, executions and military assaults in Iraq and Syria in recent days. The upsurge in activity is believed to be caused by the approaching one-year anniversary of the 'caliphate'. Read the full story on Kuwait here. Nicolas Sarkozy, the former President of France, has issued a statement talking of his grief and shock. He said France had been "once more" injured and saddened by terrorism, saying the perpetrators had "declared war against not only France and democracy, but civilisation itself". He also called for vigilance to be increased following reports the suspect was known to security authorities. The attacker did not have a criminal record, the Interior Minister says, but he was known to security forces since at least 2008, who believed he may have been radicalised. There are already questions in France about how the attack was not prevented when the attacker had been known to security authorities for at least seven years. France's interior minister said he had links to terrorist groups and may have been radicalised. Le suspect a donné l'identité de Yassin Sahli, né en mars 1980. The suspect has been named as Yassin Salhi. He is believed to be 35 and from Saint-Priest, near Lyon. More from Interior Minister Bernard Cazeneuve - Salhi had been flagged as an extremist in 2006 and then police monitoring dropped off two years later. He was detained at the scene by a firefighter praised for his "courage"
Several other arrests have been made in relation to the investigation. 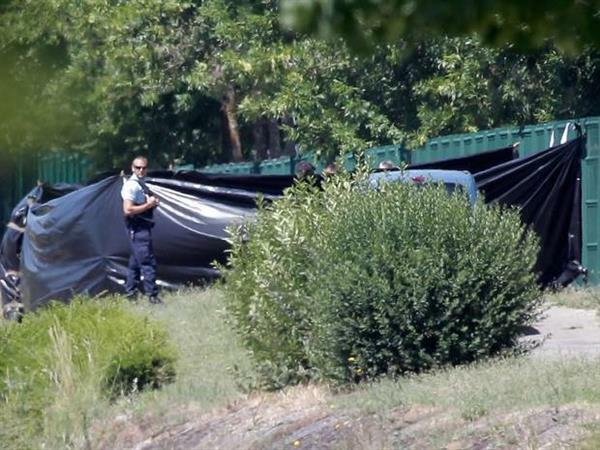 Our French correspondent, John Lichfield, says investigators believe the attacker - or attackers – had murdered the victim elsewhere and brought his body to the factory.